Go SMS Pro provides to themes according to the daylight i.e. one standard theme to be used in day, while other theme is to be used in night as night mode. It also allows the encryption of conversations. The amazing thing about encryption is that the user may set individual password for each conversations. 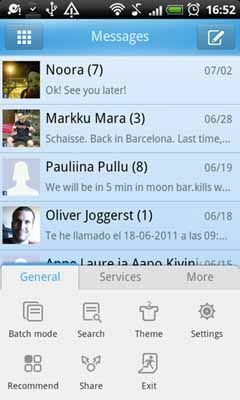 Go SMS Pro also provide both views of conversation and simple inbox mode that can be changed from settings as the user wishes. The feature of avatar for each contact is same as the default application. Go SMS Pro facilitates the users with different useful tools. The main tools of the application are SMS Blocker, Folders, Backup, Scheduled, Night Mode, Security Lock, Auto Reply and Screenshot. SMS Blocker enables the user to block the messages of any unwanted number. Folders are used to save the messages separately in a folder with desired name. Backup tool is used to backup all the messages. Scheduled tool is used to send the scheduled messages. The user just need to set the time and date to send the message. On the defined time, the message will be automatically delivered to the selected contact/number. Night Mode is a dark theme that allows the user to use the application comfortably in the night time. Security Lock is the tool to lock the whole application with a password, pattern or gesture. The “Auto Reply” feature works when the user missed someone’s call; a message is sent to that number. The content of the message can be changed as wished by the user however the length of the message is limited. Screenshot tools is used to take a screenshot of the application. Another amazing and most important feature of Go SMS Pro is Private Messages. Private Messaging is a complete secure way to have conversation with anyone secretly. For the purpose an option of Private Box exists in the menu bar of the application. The Private Box can also be made hidden that will be opened through gesture. Private Box can be locked by password or pattern. The messages of the contacts saved in private box don’t appear in general conversation. The ringtone for Private Box can also be changed and a fake notification can be made for the private message to appear in notification bar of the android smart phone. Shortly, Go SMS Pro provides the best features in this regards.